As I mentioned, I am taking a Photoshop class and this week we learned about restoring old photos. 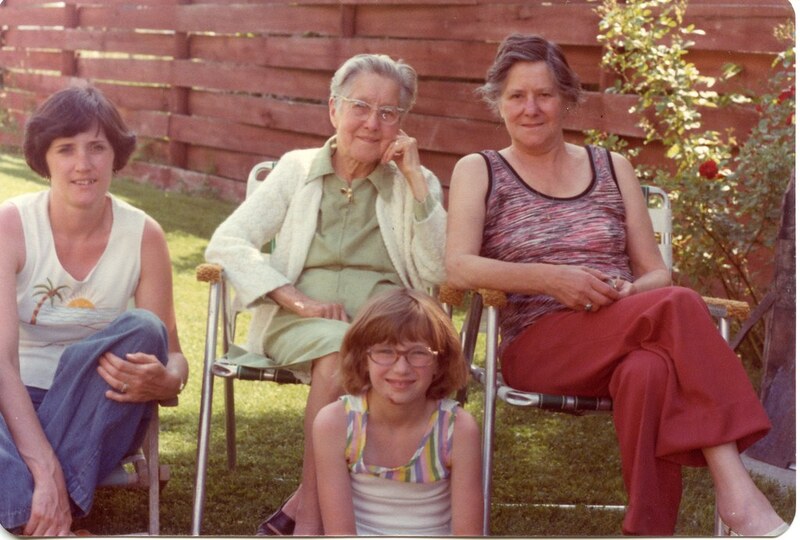 It just so happened that my mom brought me a photo album that belonged to my grandmother that I, for some reason, had stored in my things at her house in Spokane. Many of the photos neither of us had seen before and this is one of them! And it’s such a great photo! 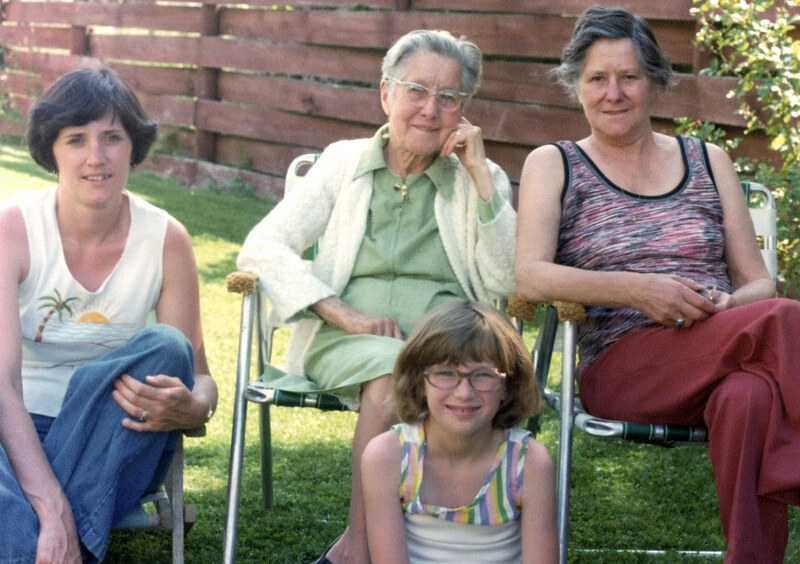 Here we have me at around 7 years old, with my mom, great-grandmother in the middle, and grandmother on the right. The original photo has a red cast to it and now I wonder why. Is it due to the fading of color in the print? It seems like a lot of old snapshots have a red cast to them. In the original photo below you will see that I have a gnarly gash on my chin. I was trying to remember how I hurt myself and then it hit me, this is when I took a serious spill on my bike. I wrote about it here. Here is my “new and improved” Photoshopped version. I corrected the color, removed a ton of dust, and removed the scab on my chin. I am kind of proud of the finished version, but in some way it makes me a little bit sad too. Like I’m rewriting history or something. It’s interesting because I posted both of these on Flickr and I got more response on the original version. One person even said that the original’s red cast appealed to them. I kind of feel like the original, red cast, scabbed chin, and all, tells more of a story. What are your thoughts? I like the warmth of the older version. The world was redder then! I generally prefer untouched photos, but the processing of this era has really let us down. The colours should never have faded the way they did. I prefer the version that you worked on. I’ll swim against the current and say I like the retouched one better. That red caste probably developed over time and your corrected image is probably what the photo looked like when printed. We get a sense of time from the fade/shift “signatures” and may even think that it is somehow authentic. But if you get in your time machine and return to any time in the past, you will find colors are remarkably consistent.